Maplesoft has announced the release of Maple T.A. 6, the newest version of its Maple T.A. testing and assessment software. 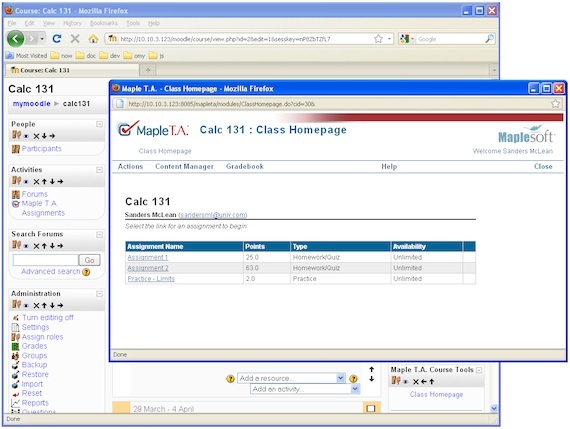 Maple T.A is a Web-based system tailored to academic applications in math and engineering, featuring direct user entry of conventional mathematical expressions and graph plotting. The software includes modules for assessment, placement testing, and assessment question generation. New features in Maple T.A. 6 include faster database performance, enhanced question content management, and support for menu, message, and text display in languages other than English. The new release also allows access to Maple T.A. authentication and assessment functionality from Moodle, along with the export of results data to the Moodle grade book. As with previous versions, the Maple T.A. connector for Blackboard is usable with this release.